Lately, my kids have been really into carrots. And when they are on a roll with a vegetable, I ride that wave as long as I can! So in an effort to keep the carrots coming, I’ve been experimenting with some tasty new ways to prepare them. And at recent Shabbat dinner at a close friend’s house, she introduced me to this amazing Cumin Lime Carrot Salad dish. It was so light and delicious and made a perfect low calorie side dish. Each bite offers the zing of the salty, lime vinaigrette with the balance of the sweet carrots. The kick of garlic and cumin add a wonderful boost of flavor! I also love that this is such an easy salad to throw together, and the colors look absolutely gorgeous. The carrots are cooked until just tender – you’ve gotta be careful not to overcook them, or your salad will be mush. Adding the lime juice and spices while the carrots are still warm allow them to really penetrate the carrots, making for one seriously delicious salad. Fresh, bright, and absolutely delicious, this unique salad recipe makes a wonderful side dish for any meal. 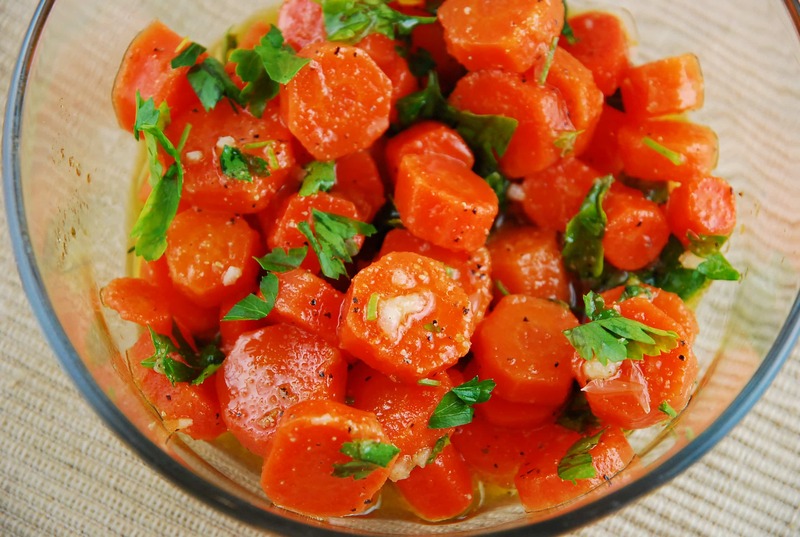 The salty lime vinaigrette contrasts the sweet carrot for a perfectly harmonious flavor combination. Bring a small pot of water to a boil. Add in carrots, and blanche briefly, just until carrots begin to soften a bit, about 2 minutes. Drain and place in a large bowl. While carrots are still hot, add in oil, lime juice, garlic, cumin, salt & pepper. Toss well to coat. Cover and refrigerate for at least 1 hour. Just before serving, add in parsley and toss again. Oh my you are so wonderful. I have learned so much from this site. I am new at this,but I am learning. Is it true that 1 tsp of olive oil is one point; and 3 tsp equal, 1 tbsp? That being said, how many points are there in 1 tbsp of Olive Oil? Is it 2.5 points? Please help me, I need to learn the proper way to calculate, so that I can be successful. The cup of carrots would be 0, and olive oil would be 2.5 or do we round it. Help, help, help! Where do the points come from? The only thing in this recipe with a pts+ value is the Tbsp of olive oil. That’s 3 pts+.